Lorrie Frasure-Yokley is an Associate Professor of Political Science at UCLA. Dr. Frasure-Yokley is an Associate Professor of Political Science at the University of California-Los Angeles. Her research interests include racial/ethnic political behavior, immigrant political incorporation, African American politics, women and politics, and state and local politics. 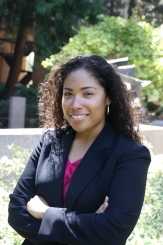 In 2015, she became the first woman of color to earn tenure and promotion in the Political Science Department at UCLA. Her book, Racial and Ethnic Politics in American Suburbs (Cambridge University Press) is the 2016 winner of two national book awards by the American Political Science Association (APSA), including the Best Book about Race Relations in the United States from the Race, Ethnicity and Politics (REP) Section, and the Dennis Judd Best Book Award in Urban and Local Politics. She examines international and domestic migration to American suburbs and the responsiveness of state and local institutions to the political and policy concerns of immigrant and ethnic minority groups. She is the co-Principal Investigator of the Collaborative Multiracial Post-Election Survey (CMPS) 2008 and 2012, the first multi-racial, multi-ethnic, multi-lingual post-election study of racial and political preferences and behavior among registered voters in the United States. In 2016, the Collaborative Multiracial Post-Election Survey (CMPS) brought together a consortium of over 80 scholars, across 55 universities/colleges to create the first national, cooperative, 100% user content driven, multi-racial, multi-ethnic, multi-lingual, post-election survey of registered and non-registered adults in a presidential election. With over 350 electoral, civic and policy-related survey questions, the CMPS queried more than 10,000 people in five languages — English, Spanish, Chinese, Korean and Vietnamese. Professor Frasure-Yokley is the recipient of several local and national awards including the Ford Foundation Dissertation and Postdoctoral Fellowship Awards from the National Research Council of the National Academies, and the Clarence Stone Young Scholars Award of the American Political Science Association’s Urban Politics Section. She was selected by the UCLA Academic Senate Committee on Teaching to receive the 2018 Distinguished Teaching Award for Senate Faculty, with a special citation for “Distinction in Teaching at the Graduate Level”, to particularly honor her contribution to graduate teaching. She received her Ph.D. and MA in Political Science from the University of Maryland-College Park, a Master in Public Policy (MPP) from the University of Chicago, and a BA in Political Science from the University of Illinois, Urbana-Champaign. Prior to joining the faculty of UCLA, she was a Postdoctoral Associate and Visiting Assistant Professor in the Department of Government at Cornell University. She is a first-generation college graduate, born and raised on the Southside of Chicago.